“The Hunger Games” was a better book, but “Catching Fire” is the better film. The Hunger Games: Catching Fire is as awesomely crafted as any blockbuster of this century actually, and is a remarkable and intelligent entry into the canon of dystopian sci-fi. Francis Lawrence (“I Am Legend,” “Water for Elephants”), the director, opts for sharp and steady visual composition. I looked at the original film by Gary Ross again, and the camera too self-consciously bobbles around. “Catching Fire” in comparison is far more confident – the capitol of Panem is lavish and decadent, the games arena is formidable, dynamic and forcefully strategic. Twenty-four tributes enter the arena until one survivor will come out, as typical to the games’ history. In the sequel, Katniss Everdeen (Jennifer Lawrence) has relinquished into solitude for nearly a year since winning the 74th Hunger Games with Peeta Mellark (Josh Hutcherson) – the first in Panem’s history to have two victors. Riches and fame have not appeased her, and the powers of the Capitol know it. Within a few short scenes, President Snow (Donald Sutherland, daunting in his power) pays the Everdeen home a visit. He is candidly unhappy that the Games had two survivors and that Katniss and Peeta put on a fake veneer of love to manipulate that outcome. 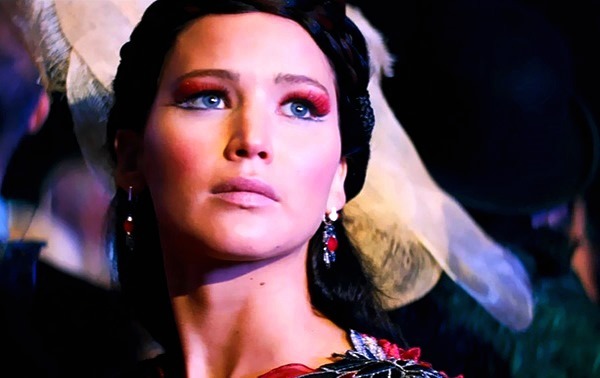 Snow will lose the dominance of the twelve districts if the people begin to revere Katniss’ defiance too much. The agreement: Katniss will put on a lifelong display of love for Peeta, and while she’s at it, express flattering devotion to the Capitol. That promise doesn’t take long to break. 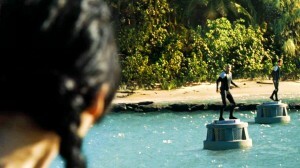 Katniss’ rebelliousness during the year anniversary victory tour gets her into a whole heap of trouble. The new gamesmaker Plutarch Heavensbee (Philip Seymour Hoffman, relishing in fastidiousness) hatches an oppressive plan with President Snow. During the next 75th Hunger Games, past victors will be reaped from the lottery, a reminder says Snow, that citizens of the districts cannot ever feel they are more powerful than the Capitol. It is obviously suspicious that the Quarter Quell instructions have been rigged for the purpose of eliminating Katniss and to placate the Districts’ people once and for all. I honestly always felt that Suzanne Collins’ original book was superb and every bit as worthy of great George Orwell fiction – you could even see the brilliance in-between the lines, and it stood alone as its own tour de force piece. 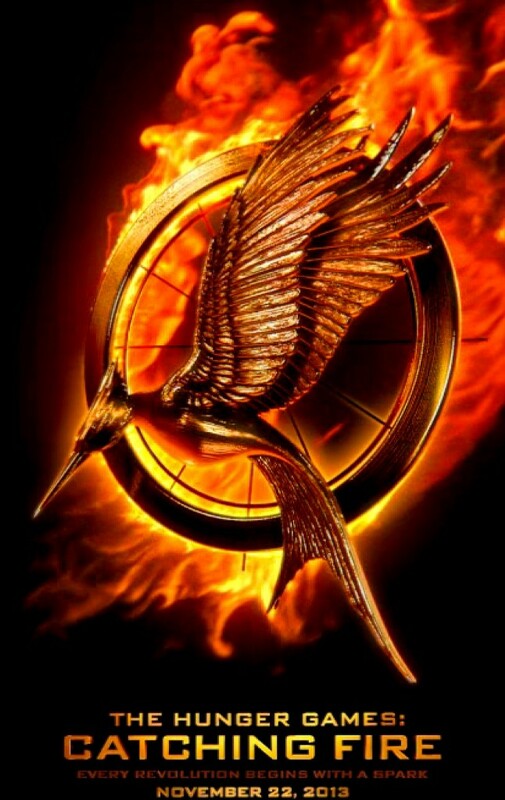 “Catching Fire” was an entertaining read and a swell follow-up. But in all honesty, it was far more convoluted when we got to the games, with multiple characters of dense and ambiguous characters, with rigged operations in the arena that was hard to even visualize. In a great way, the “Catching Fire” movie brings the book to vivid life. Any uncertainties I had about the book have been shed with this vibrant, throbbing, and I say again, confident adaptation. I’m still a tad iffy, just like the book, as to the scientific explanation of the explosion at the spectacular conclusion of the 75th games. But I am far too compelled by the entire film to not allow myself to stretch myself and believe the conclusion. I have no complaints at all against the Rube Goldberg-esque contraption of the arena, which clocks in new horrors every hour. In addition to everything else I’ve said, I want to note my feelings of admiration for the performances. Lawrence goes beyond the call for fierce as she’s more than a character, she’s an icon. Liam Hemsworth, as the friend or maybe more than friend Gale, has matured his thoughts on the need for revolution. Woody Harrelson, as former victor and games mentor Haymitch Abernathy, is haunted and world-weary in ways that reveal more character this time than in the previous installment. A couple more performances rise about the traps of facile. Elizabeth Banks as the garish Effie Trinket transcends above joke and caricature, and is even poignantly pathetic in her inability to understand normal human compassion. Stanley Tucci, most of all, doesn’t get enough credit as the bad taste host of the Hunger Games with his phony sympathy. The disingenuousness of Tucci’s Caesar Flickerman is funny and frightening at the same time. Of the new tributes, Sam Claflin (as Finnick) and Jena Malone (as Johanna) are layered and complex allies or foils that keeps Katniss guessing. We have two more “Mockingjay” installments ahead of us, which I earnestly look forward to. It might be odd that the centerpiece installment “Catching Fire” might turn out to be the best in the series. At least I’m sort of seeing it that way. I have an abstract curiosity as a side-note: I wonder what director Francis Lawrence’s dream project is. If he said it was “Catching Fire” I wouldn’t be surprised by that answer. Film Cousins: “Logan’s Run” (1976); “1984” (1984); “Battle Royale” (2001, Japan); “The Hunger Games” (2012).